Traditional yacht styling is almost impossible to find in today's modern performance-oriented racer-cruiser or even in just a plain "cruiser." It's fun to look back at the designs of S&S, Rhodes and cranky old K. Aage Neilsen, but the days of those artfully shaped, traditional and pragmatic looks are gone. There are a few reasons for this, but one is that overhangs have disappeared as designers and builders seek sailing length for boat speed and interior volume for accommodations. The goal now is to provide the best and most spacious layout in the shortest LOA. 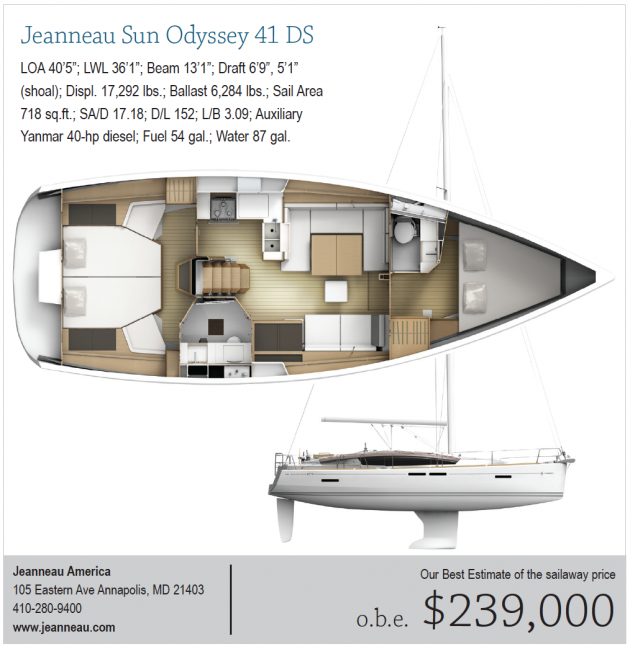 I like the look of this new Jeanneau Sun Odyssey 41 DS. It's very Euro, but beautifully contoured to integrate the need for interior headroom with the demands of a workable deck and big cockpit. The design work is by Frank Darnet/Flahault Design and Philippe Briand. Briand is one of France's most skilled designers and a favorite of mine. With an L/B of 3.09 we can consider this a very beamy boat. Keep in mind that if you added 4 feet of bow overhang and 3 feet of stern overhang we would have a boat with an LOA of 47 feet 5 inches and an L/B of 3.62. So short overhangs can distort L/B. There are no surprises in the underwater profile. The standard draft is 6 feet 9 inches with a near vertical leading edge to the keel. The rudder is a very efficient-looking deep spade. I detect a subtle chine aft starting at about station 6 and running to the transom. I think the chine is there to provide volume in the aft accommodations, but it will also enhance form stability. According to the information in the promotion materials, using the light displacement figure and my estimation of a 37-foot DWL, the D/L is 152. I think given the Briand pedigree that this boat will sail very well. This is a layout for two couples. There is a very spacious stateroom aft, tucked under the cockpit, with a big double bed, twin small seats and access to a large head. The head is not broken up into head and shower stall areas, but it could have been. I like the one big area approach. You can access the aft stateroom through the galley to starboard or through the head to port. There is a nav station to port and a short settee to port. To starboard in the salon is a U-shaped dinette. Forward of this is another stateroom with a centerline double berth and small head off to starboard. I can see an attempt at splitting the aft stateroom on centerline for two small staterooms, but so far Jeanneau has not offered this. This will be a very comfortable layout for two couples. There's nothing very unusual or novel about the rig. It looks to me like an asymmetrical cruising chute or code zero-type sail will be carried on a furler ahead of the headstay, which is about 12 inches aft of the stem. There is a self-tacking track for the jib that gives a sheeting angle of 10 degrees and that's fine for on the wind. Off the wind it would be nice to have more, but maybe that's when you deploy the other headsail. Spreaders are swept 19.5 degrees. The deckplan does not show a traveler and the mainsheet is so far forward on the boom that it's beginning to crowd the vang location. If I use the promotion material's figure for "standard sail area" I get a SA/D of 17.18. The cockpit is very spacious and has twin wheels aft. The transom is open to a broad swim platform. There is a fixed dining table. There are short jib tracks adjacent to the mast for occasions when you want a different sheeting angle than the self-tacking track allows. Lines, including the jib furling line, run aft under the coach top to primary winches at the steering stations. Halyards run aft from the house and are also buried under the coachroof. The result is an exceptionally clean deck. This is a very well designed and attractive package.